…and I know you do too! 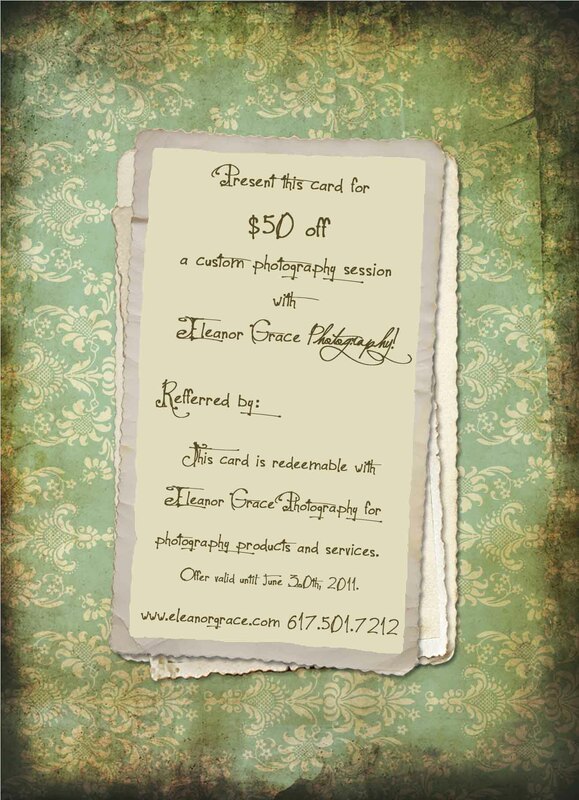 So why not spread the word about Eleanor Grace Photography so they can receive a $50 credit towards a custom photography session? And no, of course I haven’t forgotten about you! If a friend of yours books with Eleanor Grace Photography, you’ll receive a $250 gift card! You read that right. Five times the love for my friends, blog readers and Facebook fans! Basically, a totally free photo session! And get this – the more friends who book, the more discounts for you. So spread the love! Hand out referral cards like candy at your play groups and day care centers, post it on Facebook and spread the word on your Mommy boards! NOTE: This offer is only valid for May and June 2011 and referrals must book by June 30th, 2011. PS Don’t forget to “LIKE” Eleanor Grace Photography on Facebook. It makes me feel all warm and fuzzy when you do.